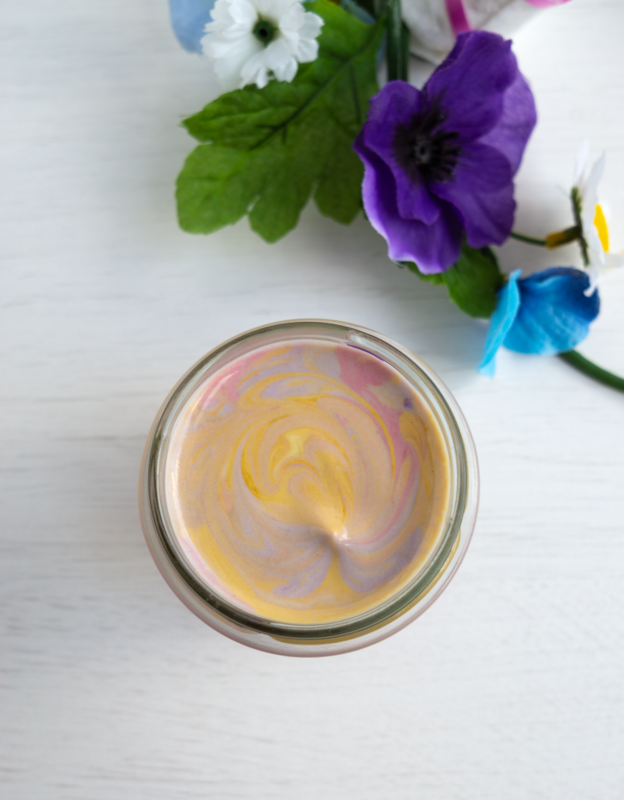 Make your own unicorn body lotion with a few simple, natural ingredients. Seriously, unicorns can do nothing wrong. They are magical. Beyond cute. And they only leave glitter and rainbows behind. Let’s forget for a moment that they may or may not be fictional characters. Cause we all know there’s a hidden unicorn in all of us. 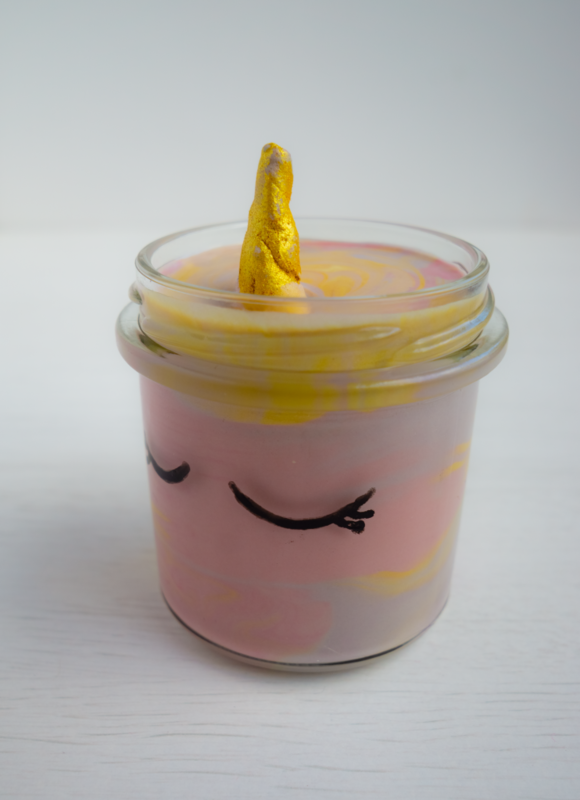 This cute unicorn body lotion recipe can help bring it out of you! 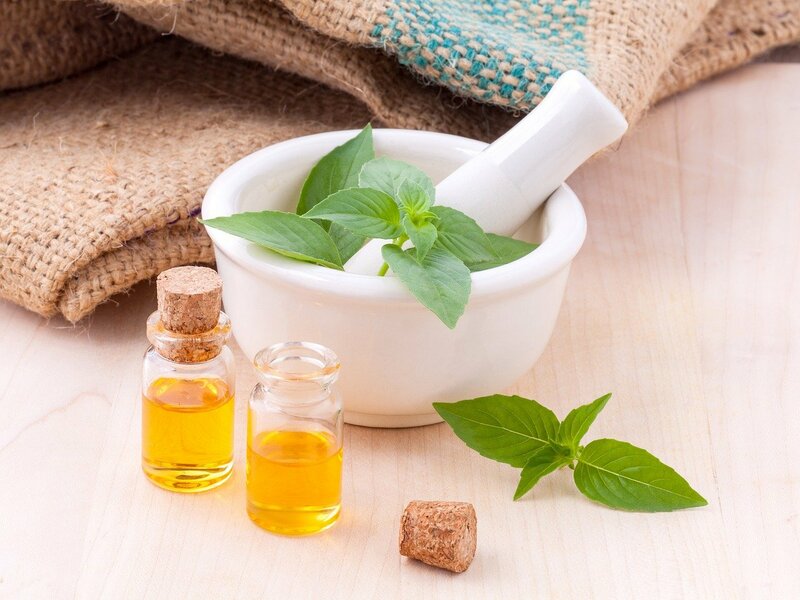 Made with only all natural ingredients, this is a great DIY beauty product if you suffer from allergies or have really sensitive skin. I colored this unicorn body lotion with cosmetic mica powders. I used all the colors I have in my stash: an irridescent pearl mica to add some glitter, a purple mica which turned into a beautiful lavender color, a gold mica and of course a pink mica powder. 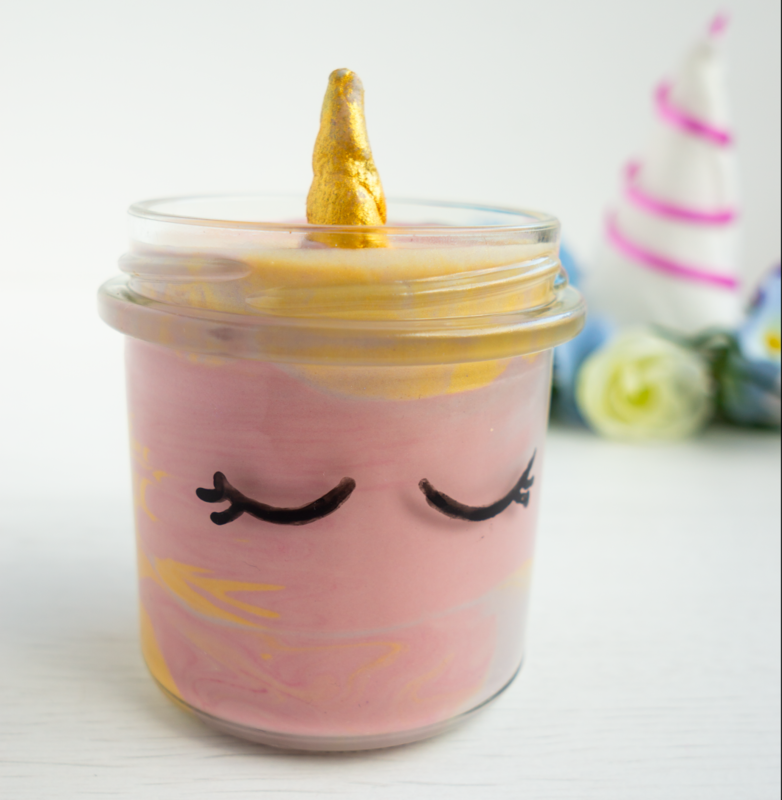 Just a little heads up so you know you can expect finding glitter in the oddest of places after you’ve made this diy unicorn body lotion! If you’re wondering how I made that cute little unicorn horn that’s sitting on top of my unicorn body lotion, here’s a quick tutorial. 1. Mix equal parts of the body wash, bubble bath or Castile soap and corn starch in a bowl. 2. Use your hands to ‘knead’ the ingredients until the mixture start to form a dough. You can add more soap/corn starch until you get the right consistency. 3. Now you can use this soap dough like a regular clay or dough. Pull off two small balls of ‘dough’ and roll them into little sausages. Lay one on top of the others do twist both sides around each other. 4. Give your little soap dough unicorn horn time to air dry (it’s best to leave it dry out overnight). Once the unicorn horn is dry, you can paint it with golden mica or edible glitter dust. 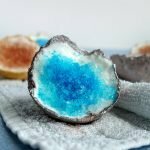 Mix a drop of rubbing alcohol with some gold mica or edible glitter dust (also known as lustre). Dip a paint brush in the mixture and evenly coat the horn with a layer of gold dust. Let air dry. A hint of glitter, a hint of sparkle ... this homemade body lotion will make you glow! 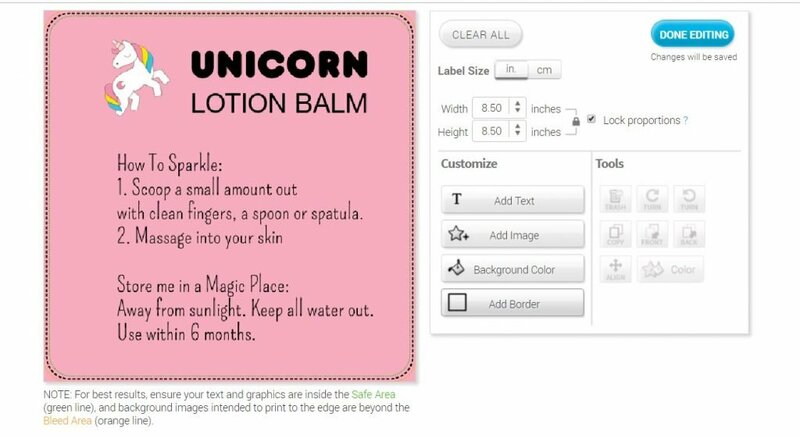 This DIY recipe makes about 5 ounces of your very own unicorn body lotion. Melt avocado butter in a double boiler or on a low setting in the microwave. Take the melted avocado butter off the heat and stir in the coconut oil. Add grapeseed and stir to combine all of the ingredients. Pour in a mixing bowl and let the mixture cool down to room temperature. Cover the bowl and put in the fridge to speed up the process. Once the mixture has thickened, add the vitamin E oil. You can also add a few drops of essential oil if you want at this point. I also added 1 teaspoon of pearl mica to the mixture. Use an electric whisk to whip the mixture into a lotion. Use a low setting. I prefer to use a mixer with a lid. Divide the whipped body lotion over three smaller bowls. Add 1/2 to 1 teaspoon of a colored mica to each bowl. Stir well to evenly distribute the color. Scoop the colored lotions into a jar, layering different colors. I recommend storing your homemade body lotion in a dark, airtight container. This recipe is made without water, so it doesn't necessarily need a preservative. 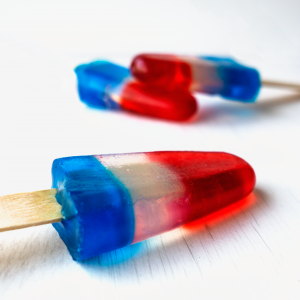 Keep all water out of the container and use clean fingers or a spoon or spatula to scoop the product out. If you want, you can add a broad spectrum preservative to this recipe. Just as important as the homemade lotion itself is its packaging. I drew cute unicorn eyes on this re-purposed jar to stay in keeping with the theme. Make sure to keep transparent containers like this in a dark place out of sunlight as exposure to light will speed up the oxidization process (and make your product spoil faster). Another great way to cover your jar is to add a custom label! When you add a label to your products you can share important information. Especially when you want to give your lotion as a gift. Who made the product Be proud of what you created and share your name! Manufacturing date Keep track of when you made the product. Estimated expiration date Determining the expiration date of a handmade product is always difficult. And without a broad-spectrum preservative proper storage really is a must. If you give your lotion as a gift make sure to share with the receiver what they should look out for. Storage tips Share how and where the product should be stored. 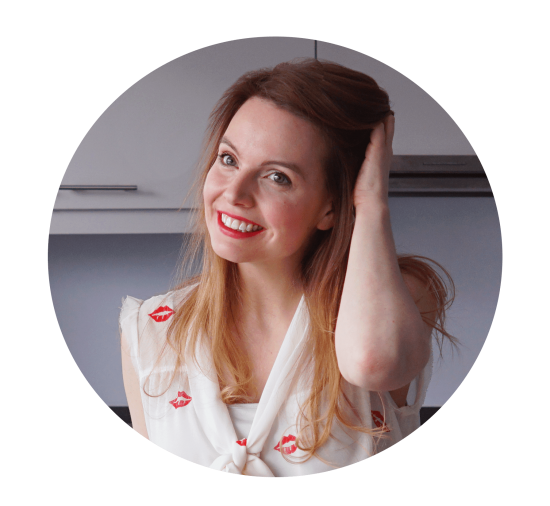 Tips for use Explain how much of the product you recommend to use, how often and how to apply it. Ingredients list It’s always good to know what ingredients are in your lotion. Even if it’s a quick reminder for yourself. Keep in mind that when you sell a product there are very specific guidelines you need to follow for labeling your products. They can even vary from one country to the next, so do your research for your business. You can always DIY your label or make a professional looking label with the Custom Labels from StickerYou. With their easy to use editor you can make your own custom labels in any shape and size you like. They have tons of cute images to choose from or you can upload your own design. I had some fun with their Custom Labels editor and made my own unicorn-tastic label. What do you think of my work in progress? Unicorn enough for you? Thanks to StickerYou for sponsoring this post. If you like this DIY than don’t forget to put a pin on it! Super cute! I definitely want to try this!